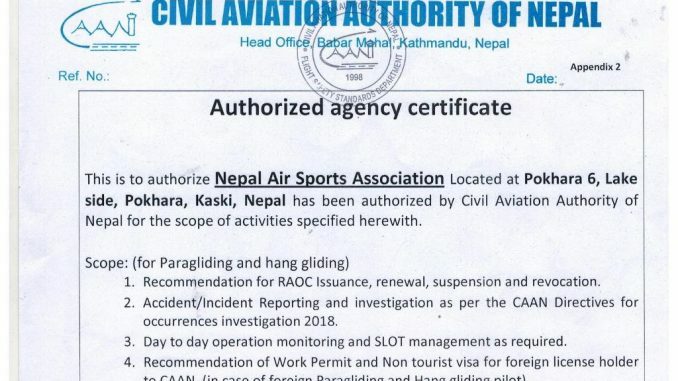 By Rup Narayan Dhakal : Pokhara—The Civil Aviation Authority of Nepal (CAAN) has designated the Nepal Air Sports Association (NAA) as an authorized agency to issue the license to paragliding and hang gliding pilots. CAAN deputy director general Rajan Pokhrel had handed over the certificate of authorization to CAAN acting chairman and CEO Krishna Bhandari the day before. The ‘authorized agency certificate’ has given eight point rights to NAA. According to 1 year term certificate, NAA has rights to issue, renew, suspense or revoke paragliding or hang gliding pilot license. Similarly, recommendation for Recreational Aviation Operator Certificate issuance, renewal, suspension and revocation rights also have been given to NAA. Accident/incident reporting and investigation and revocation also are NAA responsibilities. NAA should have day to day operation monitoring and SLOT management as required in Gandaki Province. Moreover, NAA has got the rights of recommendation of work permit and non tourist visa for foreign license holder to CAAN in case of foreign paragliding and hang gliding pilots. The certificate also states that the NAA must ensure airworthiness fitness of the paragliding and hang gliding equipment. Similarly, recommendation for foreign paragliding and hang gliding training organization for their authorization is also one of the points of the certificate. NAA will also work for recommendation to take enforcement action as stipulated in the regulations.